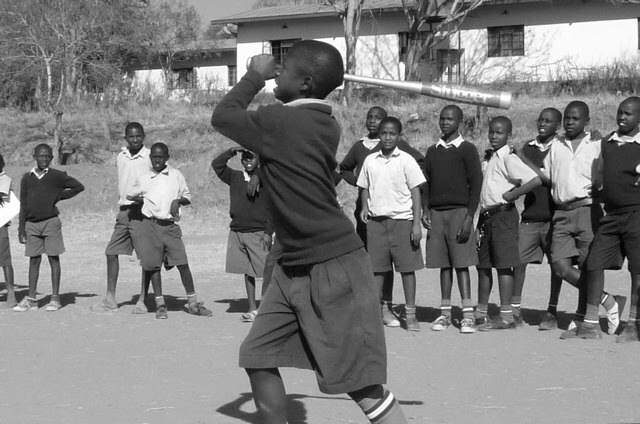 Baseball season in Kenya is always September through October. Mostly this is because the boys in the area have free sports time but also because the weather is so good. The sun shines almost every afternoon and we only seen a couple drops of rain since arriving two weeks ago. There is actually so little moisture right now that what few water holes are left are drying up. 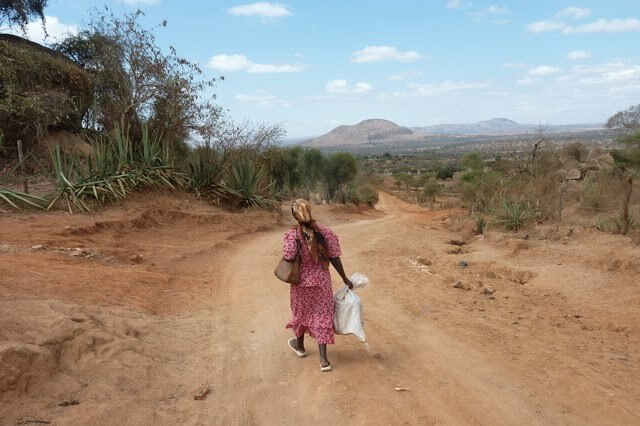 All of the farmers, cow herders, and brick makers are expecting the rains to come later this month. Water is a very precious commodity here. This is one of the reasons why wildlife viewing is so incredible here during the dry season. All of the animals gather in the open around water holes instead of dispersing into the forest areas. We had our first friendly match between Mukaa and Kilungu. Both of these teams are part of the original 5 that Jim, Special, and I started 5 years ago. 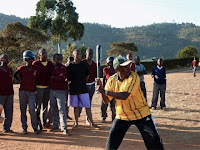 They were both eager to get ready for the upcoming tournament so we scheduled for Mukaa boys to travel to Kilungu for a real baseball game experience. 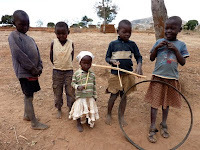 Unfortunately the coach from Mukaa contacted us and said the school's bus is broken. Thinking quickly we decided to put their team and coach into our Land Rover and drive them to the other school. Well, I have been a bit worried about how the Turtle will handle 4 people...now with Jim, Joseph, myself, the Mukaa coach, and 9 players we had 13 people! But the Turtle proved itself and got everyone there to the game on time. 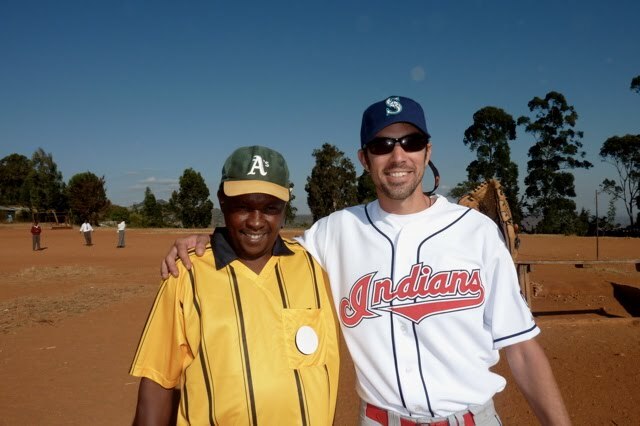 I coached the Mukaa boys and Jim coached the Kilungu team and we had a beautiful day for a baseballgame. Both teams are reallycoming along. The game ended at 1-0 in favor of Mukaa. I was very happy with the caliber of play and took it as a personal coaching victory as well. We have three new schools the rest of this week. And hopefully we will take a break this weekend to go see some animals. Stay tuned! p.s. Try to find evidence of the baseball in the picture below left. Below right: imagine yourself facing 'Wild Thing' out of Major League and you will know what this kid is going thru! Some places the people are just naturally photogenic. Africa is definitely one of those places. 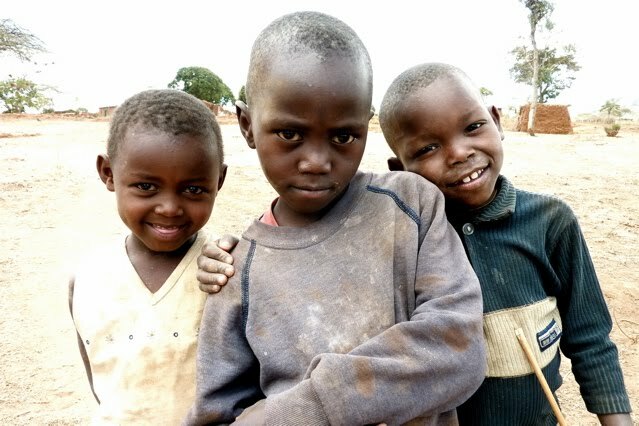 The kids here often pose for a picture, especially after you show them the result on the screen. The one boy pushing the tire rim with a stick is a common sight on our walks. How this game came about I have no idea. And check out the little boy with an even smaller baby on his back. Imagine having that responsibility when you were six years old. Their mother was no where in sight. 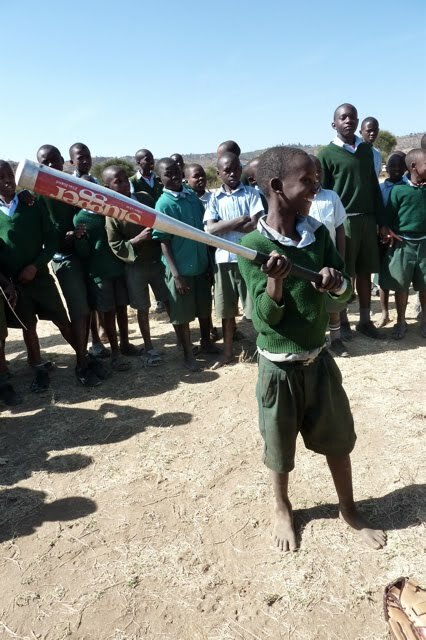 This year we brought along a few softballs and softball bats to introduce it to the girls schools and the younger kids. Our first attempt was with the Kiongwani Primary School. This is a 1st-8th grade school with girls and boys. Enthusiasm and smiles. The host of the baseball4africa tournament last year, Maiani Secondary School, came out swinging this year. With big hitters, a great first baseman, and an incredible performance from the catcher they have high hopes for this years tournament. When asked if they would like us to come back on the weekend for another practice they all jumped up saying yes. A crisis was also averted on this afternoon. Jim was pitching with the ladies coach standing behind him calling balls and strikes. I grabbed a bat to try and show the guys how far you can really hit it. He threw a perfect strike in and I swung and hit it about as hard as I could, right off the sweet part. But instead of a high arcing homerun I hit a screaming line drive right back at Jim and the coach. My heart stopped and I thought I had ended baseball4africa 2010 with one swing. It was heading straight for Jim's shoulder and if he moved it would hit the off guard coach in the head. Then, somehow, Jim caught the line drive with his glove. Everyone was silent for a second as they let out their breath. No one had time to blink. I was speechless. I still can't believe he caught it, but I am sure glad he's still got it! Every morning we head out for a little exploration and exercise by walking around the hills and roads surrounding our host school. There are a surprising number of people for such a dry and dusty place. Houses made of mud dot the dusty roads accompanied by little farms. How they grow vegetables is beyond me in this climate and soil. 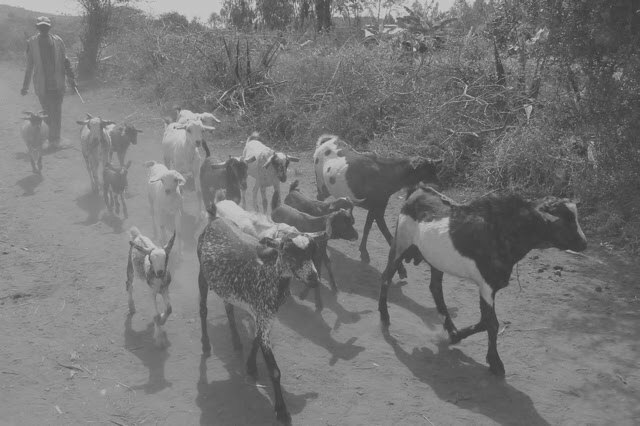 Chickens roam everywhere and boys walk along with herds of cattle and goats. We often pass women carrying large amounts of wood for stoking the fire at home or for making bricks. The children are the best. You never know how they will react. Often they scream and laugh and come running over to see us. One toddler broke into tears, terrified. And sometimes they just quit what they are doing and silently stare at us as we pass and wave. Everyone is very friendly and full of smiles. They are usually surprised when I greet them with "habari" which means 'how are you?' 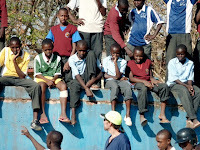 in Swahili. 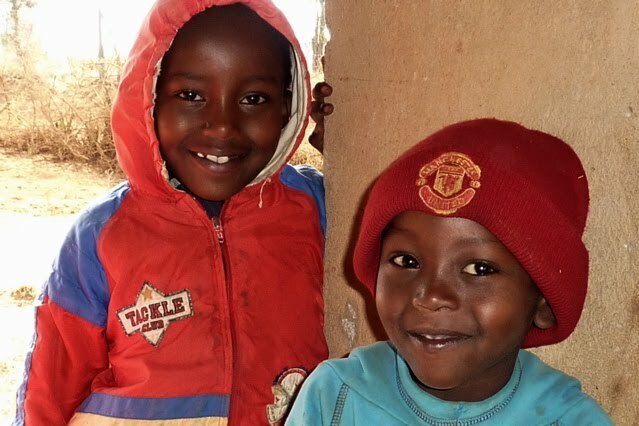 Alot of the younger generation know a little English but swahili is the only way to connect with the older people. We often end up in the tiny village near our school which is comprised of a few colorfully painted buildings and some stick stalls set up to sell vegetables. You get your meat fresh from the butcher and a cold coke from our favorite shop keeper Sara. 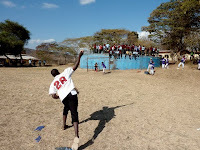 Baseball 4 Africa is well underway here in Kenya. We have visited and taught at 3 different high schools; Kiongwani, Mukaa, and Kilungu. 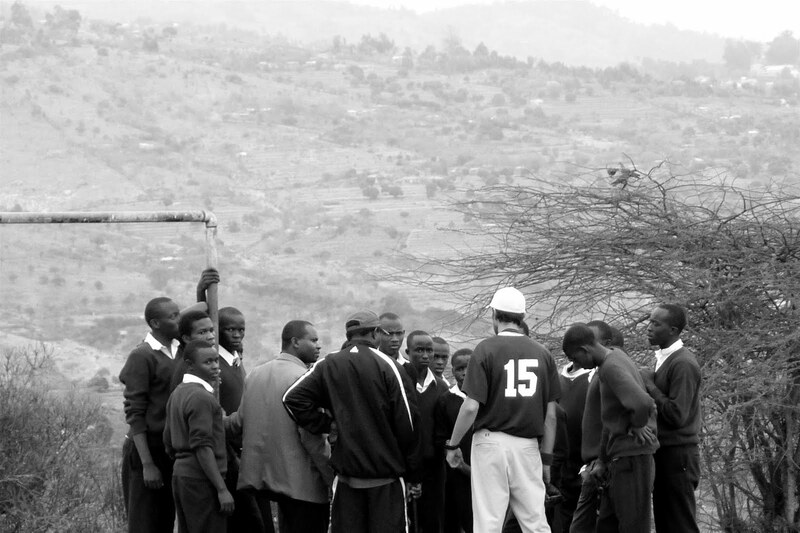 I remember all of these schools from 5 years ago when we first introduced baseball to Africa. When we go to a school we are met and greeted by the principals and deputy principles and the games masters who preside over all the sports. Then we share Kenya tea (tea with lots of milk and sugar) or Kenya coffee (instant with lots of sugar) before waiting for the boys to finish class and head to the field. There has been a huge shift of personnel this year and many of the gamesmasters have been promoted to deputy principles at other schools. This means that the baseball knowledge has moved with them so we are having to work hard to get these teams ready for the tournament on Oct 9th. You can tell that they have a much better understanding of the game than when we first started. No one is running the bases backwards (although missing second base and heading into the outfield happens on occasion), batters let bad pitches go by without swinging, and gloves are put on the correct hand. The natural talent of the players is really shining through. We have 11 school in all that we will visit and invite to the tournament. So we are going to stay pretty busy if we visit the schools more than once. A twelfth school will be added after the tournament and we have also brought supplies to teach softball to a few of the girls schools. Joseph Wambua, pictured in the yellow games master jersey, is the original games master from Kiongwani 5 years ago. 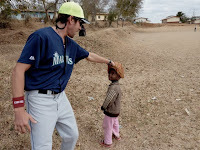 Every year he has traveled to the different schools with Jim learning baseball and becoming Baseball4Africa's official baseball expert. We arrived in Nairobi after two long, but comfortable flights from NY-Brussels-Kenya. We cleared customs around midnight with 5 out of 6 bags. Of course the one bag we lost would be the one with all my clothes/shoes/sleeping bag stuff in it. No worries, I'm sure it will show up eventually. We spent the next two days running around Nairobi getting the car, a 1988 Land Rover nicknamed the "Turtle", in order, getting insurance, and supplying up. The Turtle was a bit troubled after sitting for nearly a year, so we took it to the mechanics who toyed giving it the death warrant and then said it is fixable. So we rented a small economy and drove off east on the Mombasa highway to our host school Kiongwani Secondary School in Sultan Hamud, Kenya. Seeing giraffes nibbling at the acacia trees and looking for other wildlife kept us occupied and alert for the 1 1/2 hour drive. Yesterday we worked out with the kiongwani students for the first time. The quality of baseball here in Kenya is a drastic improvement from 5 years ago when I was last here. It is a testament to Jim coming back year after year, all the people who have donated and helped out back in America, and the fact that the older students are now passing down knowledge of the sport to younger students. Pitchers were throwing strikes, hitters were putting the ball in play, and incredibly the fielders were catching fly balls and throwing runners out at first base. I would say definite 'bad news bears' quality, which is a big step. They were all very eager to learn and I'm hoping to show them some real baseball games on the computer to give them an idea of the level to aspire to. The field is as you would expect. Big rocks and uneven dirt vastly outnumber the non rocky level places. The schools water tank looms in the background behind our backstop which is made out of an old soccer goal. Tons of students and bystanders from the village stop by to watch this new game...until a foul ball hits too close and then they scatter. This is an excerpt from my last trip to Africa. And its why all of you should go to South Africa. This is in Gans Baii, near Cape Town, South Africa. It is where national geographic and the discovery channel go to film the Great Whites. I can't wait to do it again! 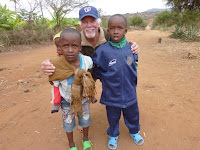 I am almost ready to head out to Kenya for year 5 of baseball4africa. This is all the equipment that we are attempting to cram into bags and fly with us to outfit the different teams we train in rural Kenya. 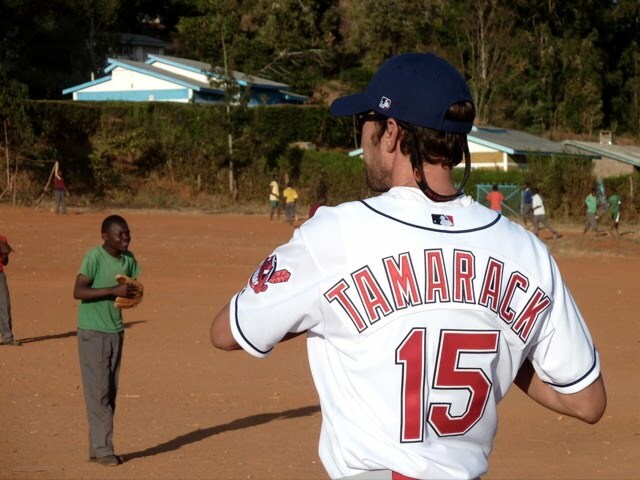 Baseball4Africa was the dream of my dad, Jim Tamarack, put into motion over 5 years ago. 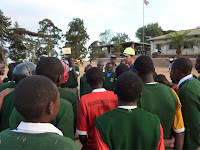 The two of us, plus another longtime friend "Special" Ed Derst, traveled to Kiongwani Secondary School in Sultun Hamud, Kenya with enough donated baseball equipment to outfit 5 teams. 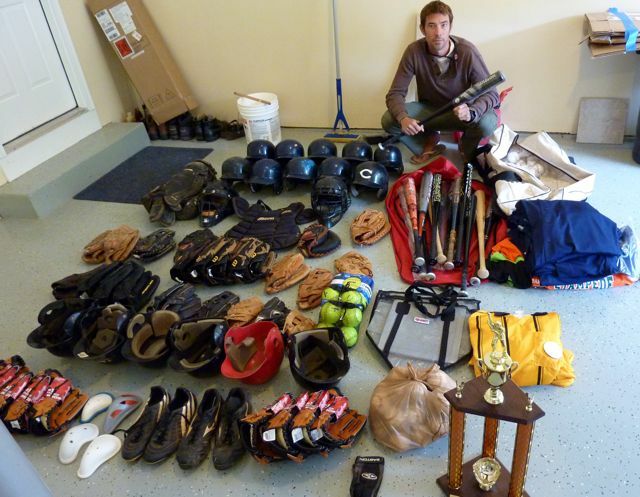 We are talking gloves, baseballs, bases, helmets, catchers gear, uniforms, hats, cleats, and bats. It really takes alot of equipment to play baseball. I thought carrying all of those bags was going to be the hard part. 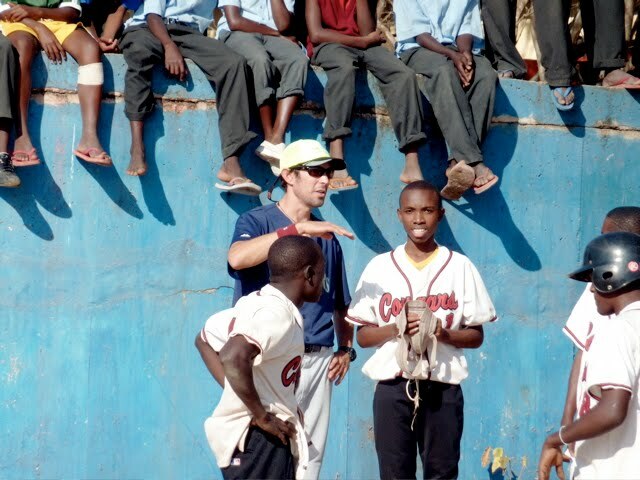 I didn't count on baseball being such a completely foreign concept to these high school age African kids. I would ask them to throw the ball and they would roll it on the ground. No one had ever heard of the Yankees, or Hank Aaron, or Babe Ruth. Nor had they ever seen or bat, or played stickball. But they did have natural athletic talent and a passion for learning. I would say we took them from knowing absolutely nothing that year to a young bad news bears style of playing at the final tournament. Jim has continued to go back every Fall and bring more equipment, outfit and train more teams, and bring them together for a final tournament. I have been working in California for the past 4 years so I havn't been back until now. I am really excited to be a part of it again and see how much they have improved. 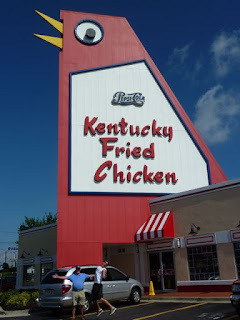 With a Braves win and a visit to the Big Chicken no trip to Atlanta will be a waste. 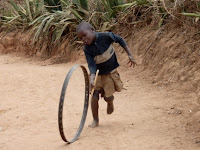 I stopped in A Town before flying out to Africa and enjoyed non stop entertainment. 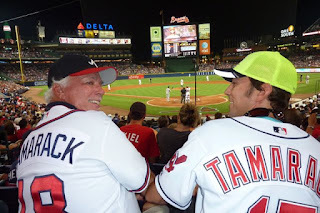 Lea drove her 51mpg Prius up from New Orleans and my dad and I tried our best to get on the big screen at Turner field by wearing our matching jerseys. We thought we had a chance when we scored $65 seats right behind home plate with $10food credit and a parking pass for $50 outside the Varsity, another greasy Atlanta staple. We didn't get on the big screen but we were treated to an amazing game and fireworks after. The next day was spent at the GA aquarium. It was my second time but I was blown away. The whale shark tank (they have 4 now) was absolutely gorgeous. Whale Sharks, massive manta rays, sawfish, ragged toothed sharks, and tons of other fish swam in one of the biggest tanks in the world. And we managed to get back to Grandma's house just before the skies opened up and I experienced my first thunderstorm in years. It may have only lasted for 30 minutes but I love it. We really miss those on the West coast. Now a 13 hour drive has brought me to NY where I will fly out to Nairobi tomorrow. The fun just doesn't stop. Savannah has been very good to me this past week. We have had nothing but sunny days without a drop of rain, yet everything is lush and green. The water is warm and butterflies are in the gardens flying from flower to flower. And Isle of Hope has been just that. Its been great seeing old friends but now its time to say farewell to this idyllic southern city. Just another gorgeous summer day in the Georgia marshes. My mom and I drove down to Melon Bluff to meet a friend for a sunset kayak and what a sunset kayak it turned out to be. We started off against the quickly rising tide and past hundred year old live oak trees covered in draping spanish moss hanging precariously out over the creek. A few bare limbs served as roost for huge wood storks, ibis, comorants, and a lone roseatte spoonbill. Little birds and marsh hens fluttered out from the marsh grass when we glided by and a kingfisher darted past us at one point. The high tide allowed us to paddle up to secret spot in among the trees which is where I took the black and white picture from. Then as we circled back thru the finger creeks we were treated with a spectacular sunset. I hope these marshes never change. It is pretty wonderful to be back on the east coast enjoying the warm, sunny summer season. It feels like it has been forever since I have experienced a summer here in Savannah. The gardens are lush, the water is warm, and its the perfect temperature to spend all day in the water. 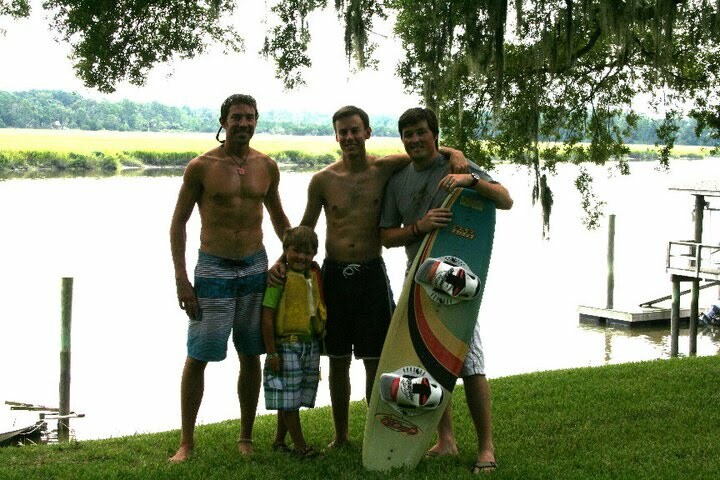 Ed, Dennis, Izzy and I headed out for a day of wakeboarding and skurfing in the Vernon River. Everyone did great, but the real surprise of the day was Izzy pulling himself on a surf board at age 6. 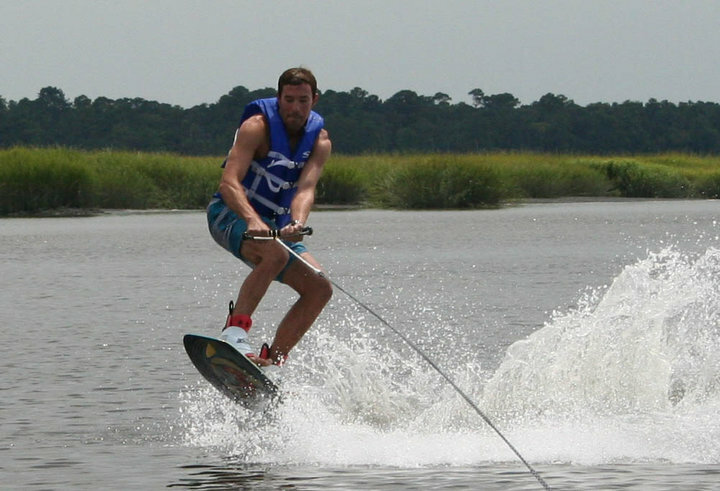 The top two pictures show the difference between wakeboarding (feet in bindings) and skurfing (just the surfboard). 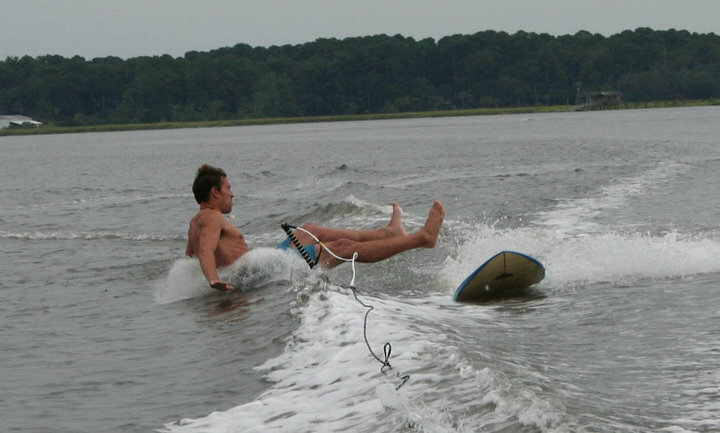 And just for fun, the bottom picture is to show that not everyone can maintain grace when they go down.